Nothing says summer like a scoop of ice cream! I love ice cream and have fond memories of my niece and I sitting at our grandmothers round kitchen table, stirring inside green plastic bowls of the frozen treat, making ice cream soup! It was our favorite. Our grandmother kept the gallon containers of ice cream in her freezer in the back room. We would eat it all the time. So my love for ice cream goes way back. Through the years taste buds change and I ventured out from plain chocolate and vanilla with chocolate syrup to other flavors, and quickly found that mint chocolate chip is pretty darn tasty! Kelsie loves all flavors of ice cream she’s ever tried, mint chocolate chip being one of her favorites. With food allergies, we can’t buy very many varieties from the store, and mint chocolate chip was one of those that we thought we’d never see again. Until….one day on Pinterest, I’m completely obsessed! Are you following me? 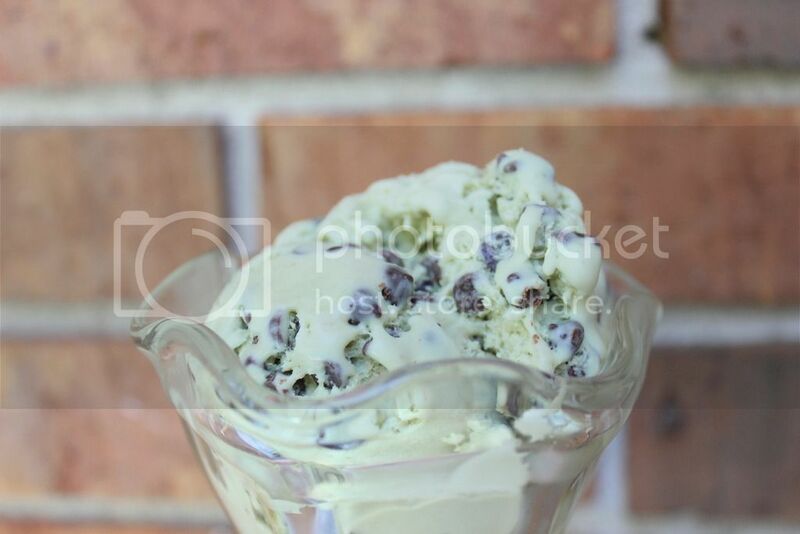 One of my favorite food allergy bloggers posted a recipe for a no churn mint chocolate chip ice cream, thank you so much Petite Allergy Treats! I had to modify hers since Kelsie is allergic to coconut, but the idea came straight from her. I never would have tempted it if it wasn’t for Laura. And I tried the whole trying to get the color from spinach like she did, however my Ninja isn’t nearly as great, and I couldn’t get anything. Oh well, luckily I had all natural dye from India Tree. Scroll down for a printable version. Put your heavy whipping cream into a bowl and beat until it’s almost whipped cream consistency. In a separate bowl mix together your vanilla, peppermint, condensed milk, and chocolate chips until thoroughly incorporated. Fold your condensed milk mixture into your heavy whipping cream. Spread evenly into a freezer safe container. YUM! My son’s favorite ice cream is mint chocolate chip too. He calls it the ‘green ice cream’ and he picks it every time 🙂 This is so simple but really yummy. I made one a few weeks back and added the mint oreos into the ice cream before I froze it. That probably would not work with the allergies, but we loved it. PINNING to try your version. I love the chocolate chips added in. Thank you so much for pinning! Your recipe sounds delicious! Of course oreos aren’t allowed with the food allergies, however there is a brand, Back to Basics, that has an oreo style cookie that would be perfect. 🙂 Thanks for sharing your version because I think I need to make it! I have peppermint chocolate chips so I am going to put these in instead of adding the peppermint extract. That’s a great idea! Yum! How is this even possible? No churn ice cream, yes please! I always find myself without a churn, and especially at this time of year there are so many fantastic ice cream recipes, I’m so happy there’s one that I can try! I have a few others that are no churn as well you should check out. 🙂 I have a churn, but I usually forget to put the canister in the freezer, so the no-churns are my favorite! Yay for no churn! Yay for ice cream! Yay for mint chocolate!! Looks soooo good! Thanks for the recipe! OMG This looks DELICIOUS! Thank you for sharing! Mint chocolate chip is mine and my son’s favorite ice cream. My husband is not crazy about it but I will be trying this as a treat for the two of us. Sounds so good! I love how versatile those two ingredients make the no churn ice creams. Mint choc chip is one of my favourite icecream flavours. This sounds delicious and I love the fact it’s no churn! Came over on Favorite Things,. Glad to find you site. Thanks for coming by Melanie! You can totally make this, it’s so simple. Once I discovered how to make no churn ice cream, there was no stopping me, lol. I love playing with different flavor combinations. Adding this recipe to my list. Thanks for linking up with us at Thursday Favorite Things! No churn ice cream is the best! Hope you are have a great summer so far Joanna! Oh my goodness, this sounds and looks completely amazing! I have got to try this sometime! A dip of this Ice Cream would be great right now. Hope you are having a wonderful day and thanks so much for sharing your awesome post with Full Plate Thursday!